The reality is there is no avenue left for advocacy, grievances or redress in a system dominated by global corporations and self-serving political insiders. What’s striking about the protests in Paris against higher fuel taxes is the universality of the protesters’ expressions of being fed up with a status quo that no longer listens to them. Their commentaries of frustration are echoed around the world, from the U.S. to China: ‘People are in the red. They can’t afford to eat’. The basic problem is obvious: wages have stagnated while taxes, interest on debt and costs of essentials have soared. When officialdom claims the higher fuel taxes are an expression of concern for the environment, it’s difficult not to gag at the hypocrisy: where are the higher taxes on the corporate and private jets, and the bunker-fuel burning freighters that ply the seas in service of globalization? People are frustrated because debt-serfs and tax donkeys don’t have any real political options: with all the political parties mere variations of a sclerotic, self-serving elite, our only choice is to either not vote at all or vote for the least bad option. In the original version of feudalism, peasants armed with pitchforks knew where to go for redress or regime change: the feudal lord’s castle on the hill. 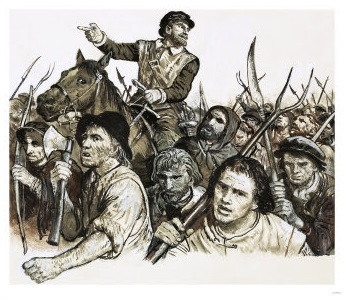 Though you won’t find this in conventional narratives of the Middle Ages, peasant revolts were a common occurrence; serfs weren’t always delighted to toil for their noble masters. In the present era of corporate dominance, where can serfs go to demand redress and financial freedom from the neofeudal system? Nowhere. The global corporations that own the land and the productive assets have no castle that can be stormed; they exist in an abstract financial world of stock shares, buybacks, bonds, lobbyists and political influence. The reality is there is no avenue left for advocacy, grievances or redress in a system dominated by global corporations and self-serving political insiders. The castle on the hill doesn’t exist; it is diffused all over the planet, and well protected by state minions who listen only to neofeudal corporate interests. The problem for well-meaning politicos is the system cannot be reformed or repaired: the cartel-state socio-economic system is now the wrong unit size and the wrong structure. As I explain my my new book, the cost of buying political influence is a small fraction of the gains reaped from buying the influence. Mere debt-serfs and tax donkeys cannot compete with campaign contributions and influence purchased with tens of millions of dollars in cartel profits. The system isn’t simply rigged to benefit insiders–it’s incapable of listening to debt-serfs and tax donkeys because their demands would collapse the system. Corporate power and self-serving insiders destroy democracy. That is the heart of neofeudalism, which is the only possible output of the status quo. December 5, 2018 in CORPRO-Fascism.